The following steps will help you reset the hopTo account information on your mobile device. It will NOT reset any hopTo user information (for example user password) nor will it delete any file content. hopTo wants to provide the most intuitive user experience possible. All of your mobile devices are automatically registered with hopTo at sign in allowing you to quickly access your files and applications as soon as the app launches. Therefore you are not required to enter your hopTo username every time the app launches. You must stop the iPad app before you do the reset. Without doing so, the app keeps running in the background and the reset does not take effect. 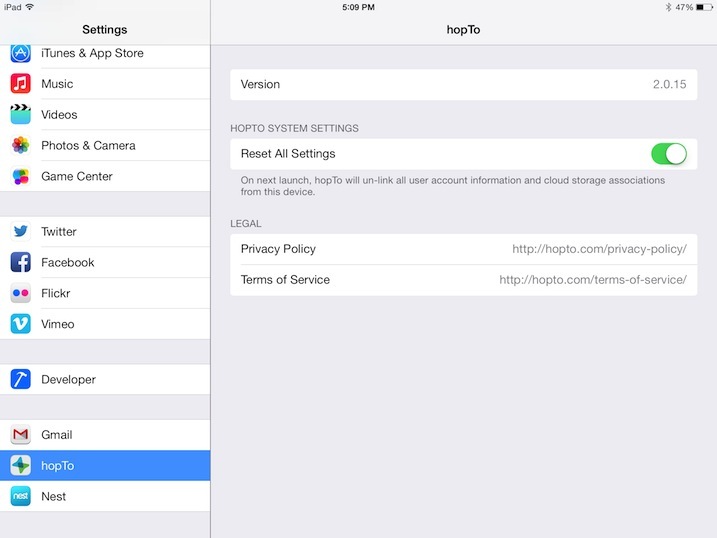 Next time you launch the hopTo app all the user settings will be reset.